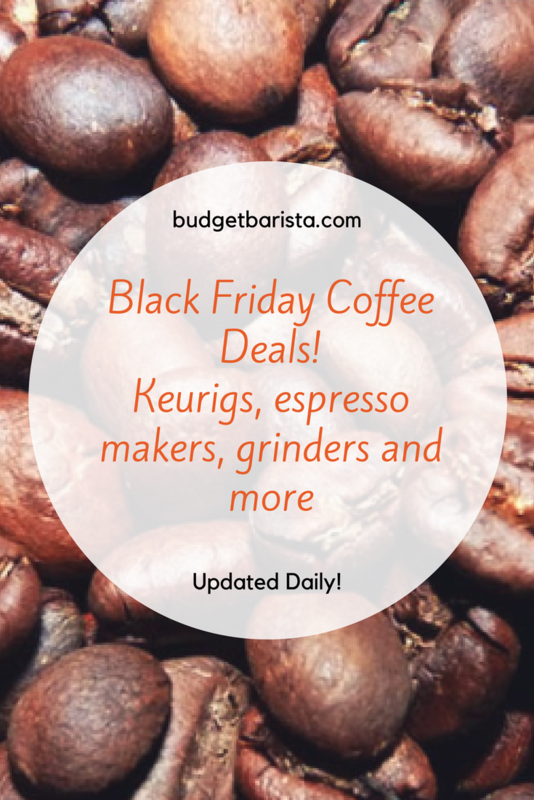 Looking for a simple, fast way to prepare the perfect cup of coffee? Step away from the Keurig and grab a French press. 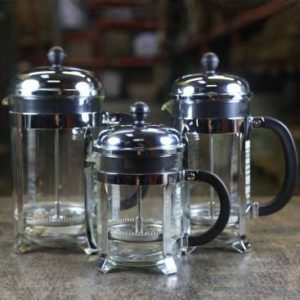 One of the simplest and most affordable ways of preparing a coffee-shop worthy cup, a French press consists of a carafe with a stainless steel coffee filter screen. For overall quality and value, the Bodum Chambord tops our list. Because it uses a coarse grind that’s fully immersed in water, it allows for a fuller extraction from the beans and there’s no loss of flavor due to a paper filter. Tea fans can can also use a French press to brew loose tea. Heat water to 195F/ 95C. Do not use boiling water, as it will alter the taste and burn the beans. Add coarse ground coffee beans (preferably freshly ground) in a ratio of 1 heaping tablespoon (7-8 grams) per 200ml (6.7 oz) water. Pour the hot water over the beans. Give it a gentle stir. Place the cover over the carafe, leaving the plunger in the “up” position. Wait 3-4 minutes and then slowly and gently press down on the plunger. Allow the beans to rest for 30 seconds to maximize the flavor and allow any fine grit to settle. Simple enough, right? 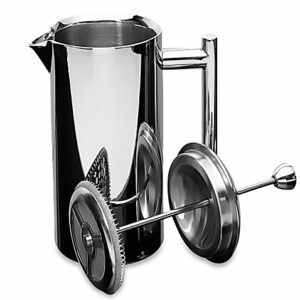 Now on to my favorite French presses (click for prices on Amazon)…. Bodum is known for popularizing the French press across Europe and its flagship design, the Chambord, hasn’t changed much since it was first introduced into the market. Available in four different sizes, this glass and stainless steel model doesn’t use any plastic (except for a Polypropylene handle) which mitigates the risk of anything tampering with the coffee’s flavor. Bodum has nailed the basics with the Chambord and the borosilicate glass resists stains and temperature changes and is dishwasher safe and easy to clean. Users have noted that the three-part stainless steel filter system is especially adept at keeping grounds out of the coffee. The Chambord is also available in the Copper Classic. Check for prices and sales at Amazon here. For a mini version of the crowd-favorite Bodum Chambord, try the 17 ounce model, which is just a mini version of their full-sized Chambord, but the perfect amount of coffee (four cups) for two people. Another one of the best French press coffee makers in the same price range is the Kona French press, which is a user favorite on Amazon. It also features a three-part stainless steel filter that users have noted for its ability to keep any loose grounds out of the coffee. Its wide base and thick, thermal borosilicate glass keeps heat in and is dishwasher safe. Some users have reported dropping it without any breaking or chipping. One thing that sets it apart from the Bodum Chambord is its stylish plastic frame, giving it a more modern look. The Kona French press also comes with a free coffee scoop and an extra replacement screen, making it an excellent value for the price. 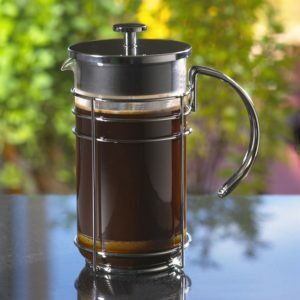 Performing on par with more expensive models, the Bodum Brazil is one of the most affordable ways to get your hands on a French press that produces an excellent cup of coffee. Available in three sizes and four colors, the carafe is made from heat-resistant borosilicate glass and a BPA free polypropylene handle and base. The lid is also made of plastic. A three piece, stainless steel filter, keeps the finished product ground-free. 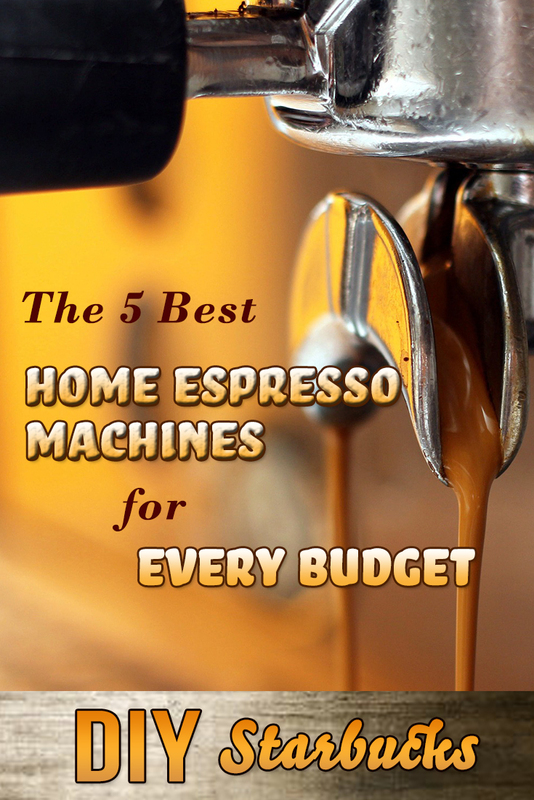 While this value-priced model doesn’t keep coffee as hot as other models, it’s still dishwasher safe, has replaceable parts and produces excellent coffee. Stylish and functional, the Frieling has a double wall construction that keeps heat in, while remaining cool to the touch. 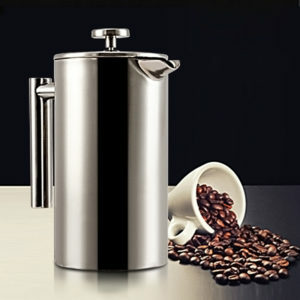 Coffee stays hot for a long time, one of the main advantages of stainless steel over glass. It’s also more durable than a glass carafe. 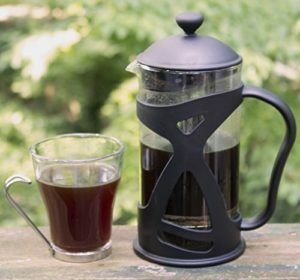 This French press is also a stylish way to serve cold beverages. Entirely dishwasher safe, the Frieling is available in five different sizes and a brushed or polished finish. You can also pick up a matching sugar bowl and creamer. This one is a bit of a splurge, but you’ll have it for life. It also makes a wonderful gift. Check for current prices on Amazon here. The SterlingPro is four times more durable than similar glass models and keep liquid hotter than glass. It features a double screens system that allows the first screen the tightly hug the side of the carafe, while the second screen captures any sediment that slips through the first one. This model in available in three sizes and also comes with two replacement screens. Not quite as durable as the Frieling, the SterlingPro is still an excellent pick for the price. 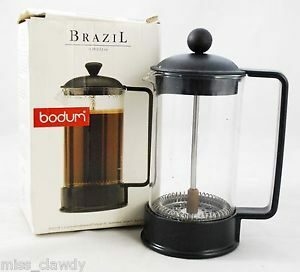 For French press coffee on the run, nothing beats the Bodum Travel French Press. A vacuum sealed, double wall, stainless steel 15 oz. mug keeps coffee hot for hours, yet stays cool to the touch. Personalize the rubber silicone grip with a choice of several colors. 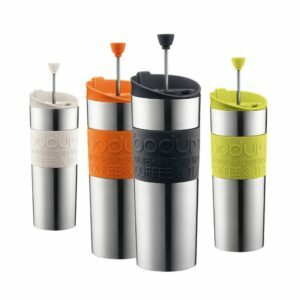 Like other Bodum’s, their portable mug also reduces sediment, keeping the grounds separate from the good stuff. If you’re undergoing a more rugged adventure, consider the GSI Outdoor Java Press Coffee Maker. It’s a quick and easy way to make coffee for a crowd: 50 ounces at a time. Its filter ensures you’ll keep the flavor in and the trail out. Also available in 30 oz. For a more distinct design, that also produces an extraordinary cup of coffee, the Grosche Madrid hits all the high points. The tempered German glass carafe is encased in a stylish chrome cage that’s functional, in that it protects the carafe from chipping or breaking, yet refreshingly minimal in design. The tempered glass helps to keep your brew warm, while allowing for optimal flavor extraction. Available in four sizes. Related: Chemex vs. French Press: Who Wins the Best Coffee Battle?